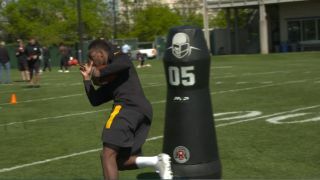 The Pittsburgh Steelers of the NFL have started testing a robotic tackling dummy in the hopes it will keep players healthier. The robot, created by current and former students of Dartmouth College, aims to help reduce the number of concussions experienced during practice. Tackling was banned at Dartmouth College by coach Buddy Teevens in 2010. The coach faced backlash from football traditionalists for his decision. But, thanks to a few passionate Dartmouth engineering students, a robot tackling dummy was created in the summer of 2015 for players to practice on instead. The Steelers have named the robot MVP, short for Mobile Virtual Player, and have deployed a few robots for use during practice. By having a robot to tackle instead of a person, the Steelers hope to reduce the chances of concussing one of its own players. The MVP robot resembles a punching bag on wheels, but don't let its unassuming looks fool you. This robot is fast. "You realize it's fast when you have to catch up to it. It's a good visual effect of how a running back or receiver catches the ball on the sidelines to give us a pursuit and open us up and give us an angle to the ball," said Stephon Tuitt, defensive end for the Steelers. While Google has been busy showing off its artificially intelligent assistant this week, I, for one, am glad the tackling robot still requires a human operator. Otherwise, it's only a matter of time before it's tired of being slammed to the ground over and over again. The robot was initially controlled by an iPhone app, but is now controlled using a controller from a radio controlled car. The MVP robot is still in testing phases, and won't be available for widespread use until 2017.